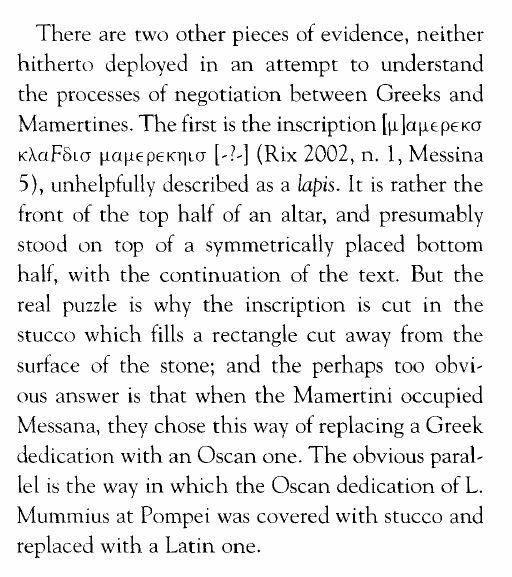 M. H. Crawford, ‘The Oscan inscriptions of Messana’ in Guerra e pace in Sicilia e nel Medlterraneo antico, VIII-III sec. a.C.; arte, prassi e teoria della pace e della guerra (2006), 521-525, at p. 525. The rest of the article will be of interest to numismatists for his comments about the choice to use Greek on the coinage being a reflection of coinage as a ‘Greek phenomenon’. He also has some good comments on the choice of types by the Marmertini. The one point I’m a little fuzzy on is did anyone actually record seeing a Latin inscription on the plaster over the Oscan one in Pompeii? Or are we just assuming it must have had one? Also could some high tec imaging process allow us to see under the Mamertine stucco inscription to let us read what if anything it is covering up?